Oral Cancer is on the rise in Canada. This devastating illness can often have few or no symptoms and can be challenging to identify with the naked eye – even for a trained professional. Knowing the risk factors and getting oral screening is important for early detection and successful treatment of oral cancer. Diagnosis and treatment in the initial stages improves survival rates significantly. The VELscope screening system allows your doctor to conduct a much more detailed exam of your mouth. 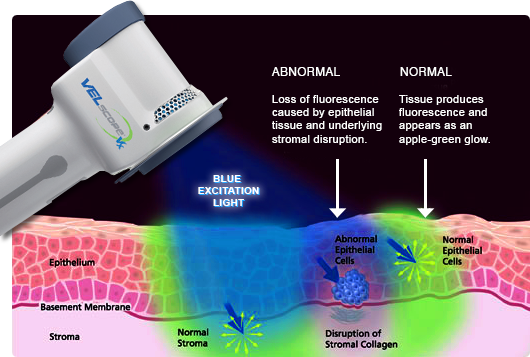 Using a special light source, the doctor is able to view oral tissues through a scope, illuminating healthy tissue and showing any abnormalities in a contrasting darker hue. If abnormal tissues are detected, your doctor can determine what further actions are required to confirm whether or not there is a cancer diagnosis. A simple, pain free brush biopsy can be conducted or further screening can be scheduled to see if the abnormalities disappear on their own. Discover Dental uses VELscope Oral Cancer Screening as a valuable tool in diagnosing oral cancer to ensure early successful treatment for patients.